A top official of the African Union is calling for unity among Somali leaders to resolve the country’s problems in the face of the ongoing power struggle between President Sheikh Sharif Sheikh Ahmed and Prime Minister Omar Abdirashid Sharmarke. Ramtane Lamamra, the continental body’s commissioner for Peace and Security, told VOA the country’s leaders should not allow the ongoing confusion to undermine the international community’s confidence in Somalia. “It is important, of course, that they (leaders) could send a message of unity to the rest of the world, especially at a time when the international community is getting ready to have this Istanbul conference on the solidarity and reconstruction of Somalia. 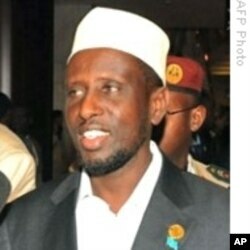 It’s important that this conference is not disturbed by the news that we are getting out of Somalia,” he said. Some observers say the political stalemate casts a shadow over the upcoming international conference on Somalia scheduled to be held in Turkey this weekend. This comes after Prime Minister Sharmarke said Tuesday that he will be staying in power despite President Ahmed’s earlier announcement that he would soon be naming a new government. Commissioner Lamamra urged the leaders to resolve their differences. “We really plead with the parties in Somalia to get their act together and to find ways to build and consolidate political consensus that will help them to move and to complete transitional period in the safest way for the country at a time when challenges are still out there, and they need to be faced with the utmost unity of purpose,” Lamamra said. President Ahmed’s government has been battling almost daily with insurgents, including al-Shabab described by Washington as a terrorist organization with strong links to al-Qaida. Analysts say the escalating power struggle between the two leaders is empowering the hard-line Islamic insurgents who have vowed to overthrow the internationally-backed government. Commissioner Lamamra said the insurgents take advantage of any situation. “The insurgents certainly will take advantage of every weakness on the part of the government and on the part of the international community to try to score goals if not to try to take control of political power in the country,” Lamamra said. He also urged the international community to deliver on its logistical and financial promises to help Somalia’s rebuilding efforts.